Malta u l-politika - Shubija fl-U.E. Araw min irid jghallimna fuq l-Unjoni Ewropea. Michael Abela, general manager, Mondial Holidays kiteb f'The Times tas-17 t'April 2004. In the area of trade with EU countries we have given up our right to decide that, for instance, a particular product should not be imported into Malta or should be subject to taxes upon importation or should be imported in small quantities. We can no longer do this. In this respect, our decision to join the EU and give up this right has exposed our local enterprises, across the whole spectrum of our economy, to the competitive forces of an open market. X'gara fil-fatt WARA li Malta saret membru shih. Suppost li l-ikel kelli jorhos wara s-shubija, imma araw x'gara kif l-ikel sar ghali aktar minn qatt qabel. Tiftakru fil-weghdiet tal-MIC, il-PN u l-Moviment IVA li meta Malta tidhol membru tal-Unjoni Ewropea, tibda tgawdi l-vantaggi ta shubija mill-ewwel jum? Kien ghalhekk li wiehed xamm xi haga tintenn meta The Times ghamlet dan l-istharrig fuq il-website taghha. Jista l-editur jghid lill-poplu Malti ghaliex irridu nistennew dawn is-snin kollha sabiex niehdu l-vantaggi ta' shubija? There has not been such an immoral and cynical base to a political structure since the collapse of the Soviet Empire. The whole European dream has been based on half truths, deception and downright lies. Can those who feel that ethical questions matter in public life support any organisation that has, with each passing year, been more and more riddled with corruption? Joschka Fischer, Ministru tal-Affarijiet Barranin Germaniz - The Guardian, <?xml:namespace prefix = st1 ns = "urn:schemas-microsoft-com:office:smarttags" />London, 26 ta' Novembru 1998. Jean-Claude Trichet, European Central Bank - The European, 13 ta' Dicembru 1998. Romano Prodi, European Commission President - Daily Telegraph, 7 t'April 1999. Theo Waigel, Ministru tal-Finanzi Germaniz. If Malta joins the EMU (Economic and Monetary Union), it will have to give up its sovereignty on monetary policy including taxation, public expenditure and public debt. Dr. Simon Busuttil, The Times 7 ta' Gunju 2003. Dr. Simon Busuttil Inflight magazine tal-Air Malta ta' Novembru 2003. Araw x'unjoni dahluna fiha. Il-kbar jahsbu ghalihom l-ewwel!!! Hija gidba fahxija li l-istati membri huma kollha ndaqs kif ilhom jghidulna l-PN u l-M.I.C. ghal snin shah. Min hu b'sahhtu jhawwel u ghalhekk pajjiz bhal <?xml:namespace prefix = st1 ns = "urn:schemas-microsoft-com:office:smarttags" />Malta se jbaghti. F'Ottubru 2003 il-Prim Ministru Olandiz, waqt zjara ufficcjali f'Malta u fil-prezenza ta' Dr. Fenech Adami qal li l-Olanda mhux konvinta li <?xml:namespace prefix = st1 ns = "urn:schemas-microsoft-com:office:smarttags" />Malta ghandha jkollha s-sitt siggu fil-Parlament Ewropew. Qal ukoll li d-differenza bejn is-siggijiet ta' stati membri kbar u dawk zghar ghandha tibqa kif inhi. Imn'Alla ma kontx jien minflok Dr. Fenech Adami ghax kont nghidlu x'jaghmel bihom il-hames siggijiet, irrispettivament x'jiddetta l-protokoll ghall-okkazjoni. F'Jannar 2004, xhur wara li Dr. Fenech Adami u Dr. Joe Borg fil-Grecja iffirmaw is-shubija ta' Malta fl-Unjoni Ewropea u ftit xhur qabel dhalna membri, il-kumpanija VF Malta Ltd issensjat 240 haddiem. Tafu fejn kienet tesporta 98% tal-prodott taghha din il-fabbrika . . . lejn l-EWROPA!!! Issa lil dawk il-240 familja staqsuhom min kien qal il-verita jekk hux Dr. Sant jew Dr. Fenech Adami. Ma sewa ghal xejn il-kliem taz-zokkor tal-PN ghax ir-realta hija morra. Joe Saliba waqt intervista fil-gurnal Malta Today 20 April 2003. John Dalli, The Times 30 April 2003. Ambaxxatur ghal-UE Ronald Gallimore The Times 9 ta' Mejju 2003. Stharrig tal-FOI, The Times 13 ta' Mejju 2003. Tbassir ekonomiku li sar mill-Kummissjoni Ewropea. 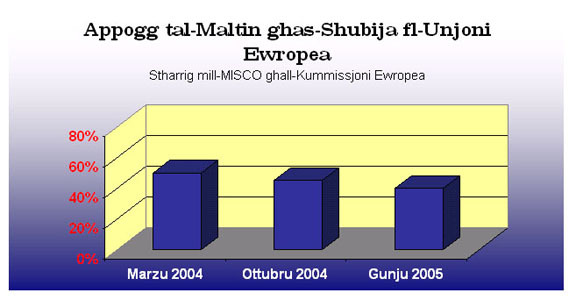 Rapport fuq Malta mill-Economic Intelligence Unit - The Times 14 ta' Gunju 2003. Editorjal ta' The Times 14 ta' Gunju 2003. Dr. Simon Busuttil f'artiklu li kiteb fl-inflight magazine ta' Gunju 2003 tal-Air Malta. MaltaToday tat-22 ta' Gunju 2003. Saviour Balzan, l-editur ta' MaltaToday kiteb fil-magazine The Circle tal-harga ta' Mejju 2003. Artiklu fil-magazine Voyager mahrug mil-RMF (harga 33). The Times 3 ta' Lulju 2003. Rapport mill-Economist Intelligence Unit, The Times 17 ta' Gunju 2003. Editorjal ta' The Malta Financial & Business Times 13 t'Awwissu 2003. Giovanni DeMartino kiteb f'The Malta Independent on Sunday 27 ta' Lulju 2003. Editorjal ta' The Malta Independent on Sunday tas-7 ta' Settembru 2003. Sezzjoni fuq l-universita (pro-EU directives), f'The Sunday Times 14 ta' Settembru 2003. Editorjal, The Malta Independent 1 ta' Jannar 2004. Editorjal ta' the Malta Independent tat-30 ta' Jannar 2004. MaltaToday 15 ta' Frar 2004. The Malta Independent 18 ta' Frar 2004. The Independent (Londra) 21 ta' Frar 2004. The Times 5 ta' Marzu 2004. Min hu midhla tal-ajruport jaf li ghal hafna snin il-passiggieri Maltin li kienu jaslu Malta kien ikollhom sezzjoni riservata ghalihom biex jittimbrawlhom il-passaport. Dan kien servizz tajjeb u efficjenti sabiex il-Maltin jinqdew ahjar u jinghataw prijorita f'arthom stess. F'Marzu 2004 dik is-sezzjoni tnehhiet u l-Maltin issa jridu joqghodu fil-kju ma' passiggieri ohra li jkunu gew minn pajjizi membri tal-UE. Dan pass il-quddiem jew pass lura? Alternattiva Demokratika  The Green Party chairperson Harry Vassallo yesterday said that the Nationalist government had betrayed the high hopes of those who were in favour of EU membership in the 2003 referendum. The behaviour of the present government is shocking to those who had entertained high hopes of a modern, transparent government open to the input of the wealth of experience and commitment available through civil society, NGOs and committed individuals, Dr Vassallo added. Dr (Josie) Muscat said membership had reduced the Central Bank to a lotto booth dictated to by Brussels and that Europe's solution to Malta's immigration woes was merely through financial donations. The Ministry for Rural Affairs and the Environment has blamed a lack of interest and the EU's complex procedures for the loss of funding for environment-related projects under the EU's Life Programme. Wara r-retorika, appelli, argumenti kontra u favur u ruxmata riklami, issa ahna membri fl-Unjoni Ewropea. Ghalhekk issa huwa c-cans taghna li naraw jekk il-problemi li qalulna li ser ikollna bis-shubija, kienux kritika minghajr bazi jew kienux twissijiet genwini. M' ghadux kaz ta' x'nahsbu li jista jigri, imma issa l-hajja taghna bhala membri fl-Unjoni Ewropea saret fatt. Ir-realta tas-shubija bdejna nghixuha lkoll. Issa bdejna mmissu b'idejna l-problemi li qalulna li mhux ser ikolna. Minkejja d-diversi weghdiet tal-Gvern Nazzjonalista u kliem sabih li l-Unjoni Ewropea tiehu hsieb lill-bdiewa Maltin u Ghawdxin, il-bdiewa xorta ntlaqtu hazin mis-shubija fl-Unjoni Ewropea. Dawn il-problemi gew ikkonfermati mill-Assocjazzjoni tal-Bdiewa. who claim local production has dwindled by close to three per cent due to flooding of the market by imported fruit and vegetables, said the government had deceived them in the run-up to EU accession because it was refusing to implement the safeguard clause. insisted that what was negotiated with the European Union and subsequently inserted in the accession treaty was not what the government had told the farmers. If I knew what was really going on during negotiations, I would not have told farmers we had a good package, Mr Axisa said. Maltese fishermen next year will only be able to catch half the tuna they used to net three years ago, after EU ministers yesterday agreed to make further cuts to the amount of bluefin tuna that can be fished next season. Minkejja li gejna mweghdin li lehen Malta ser ikun ugwali bhal dak ta' pajjizi ohra, ezempju klassiku kemm dan mhux veru hareg meta Malta insistiet li fil-kostituzzjoni Ewropea li kienet qed tigi ppreparata jigi rikonoxxut l-gheruq Nisrani tal-Ewropej. Dan il-hsieb sab rezistenza qawwija minn pajjizi kbar membri. Temmen kemm temmen Malta fuq il-valuri Nsara u l-importanza taghhom fit-tfassil tal-ideologija Ewropea, ma setghet taghmel xejn ghax fl-Unjoni hemm min hu akbar u b'sahhtu aktar minnha. Kien ta' xejn li pajjizi ohra lissnu l-istess xewqat. Il-gvern Nazzjonalista kien ilu s-snin jghid li biex nidhlu membri fl-Unjoni Ewropea rridu naghmlu s-sagrificcji. U dawn is-sagrificcji saru biex nilhqu l-kriterji mitluba qabel nissiehbu. Ghaddejna minn taqlib ekonomiku u politiku shih sabiex Malta tikwalifika ghas-shubija. Minkejja li mas-shubija kellna nibdew ingawdu l-frott tax-xoghol kollu li sar fis-snin ta' qabel is-shubija u niehdu ftit tan-nifs, spiccajna nircievu ahbar li xxokkjat lil hafna. Arthur Muscat, president tal-Malta Employers' Association, The Times 26.5.2004. Kellu jigi investiment qawwi minhabba li Malta ghandha identita gdida bhala membru fl-Unjoni Ewropea. Dan l-investiment kellu jghin biex jinholqu eluf ta' mpjiegi godda. Investiment kbir partikolari li kellu jigi u li nghata prominenza mill-media tal-PN, spicca ma giex ftit wara s-shubija. Malta suppost ghandha identita gdida li tigbed investiment gdid, imma qieghed isir il-kontra. Ghaliex kumpaniji qeghdin jitgerrxu? Tiftakru li kelna nserrhu rasna bi shubija ghax issa ghandna futur cert u ser inkunu mal-hbieb? Kien hemm min bela' l-lixka. Kulhadd iridu s-serhan il-mohh, anke jien! Imma David Casa, membru tal-Moviment IVA u wara kandidat tal-Partit Nazzjonalista ghall-elezzjoni tal-Parlament Ewropew tana bicca ahbar kera'. David Casa, The Sunday Times 9.5.2004. Minkejja l-hajja dejjem toghla minghajr kontroll effettiv, il-Gvern Nazzjonalista jrid idahhal il-munita Euro kemm jista jkun malajr. Dan x'ifisser? Ifisser li l-inflazzjoni minflok ser nikkontrollawha, il-gvern ser jiehu decizjoni li biha l-inflazzjoni tkompli tizdied, anzi jekk kif inhu mistenni, dak li sehh f'pajjizi li dahlu l-Euro isehh f'Malta wkoll, allura l-inflazzjoni li gejja fuqna ser tkun kbira hafna. Mhux talli l-hajja ma kellix toghla imma fil-fatt kellha torhos. Kemm il-gvern Nazzjonalista u kemm kandidati Nazzjonalisti hargu jiftahru li hafna prezzijiet rohsu u b'hekk il-Maltin gawdew. Bhas-soltu dan kollu nofs verita jew gidba. Fil-fatt hu nofs verita u The Times faqghet din il-buzzieqa Nazzjonalista. In-National Statistics Office fis-16 ta' Gunju hareg l-ahbar li matul Mejju (allura l-ewwel xahar shubija fl-UE), il-prezzijiet ghall-konsumatur zdiedu b'0.11 fil-mija. Mhux jonqsu kellhom bi shubija?! U l-ikel li kellu jorhos x'sar minnu? Food more expensive in July habbret The Times fil-21 t'Awwissu 2004. U f'Awwissu x'ghamel rahas l-ikel jew kien ghola? Ian Spiteri Bailey, In-Nazzjon 25.3.2004. Victor E. Ragonesi, The Times 1.5.2004. Filwaqt li kulhadd ghadu jiftakar fil-weghdiet li l-Unjoni Ewropea ser tkun is-salvazzjoni taghna, jidher car li m'hi ser tkun is-salvazzjoni xejn. Li konna naghmlu qabel, irridu nkomplu naghmluh kollu ahna stess. Dik l-ghajnuna li kellha tigi mill-Unjoni Ewropea u li kellha thaffef it-toqol tar-responsabilta li ilna ngorru sekli shah tidher li mhux gejja. Anzi min haseb li l-Unjoni Ewropea ser tghinna ngorru l-piz tat-tmexxija tal-pajjiz nispera li stenbah mir-raqda. Shubija fl-Unjoni Ewropea kellha tghin fis-soluzzjoni ghal-problema tal-qaghad f'Malta. X'opportunitajiet ta' xoghol ser ikun hemm? Jghidilna Arnold Cassola. Arnold Cassola, The Sunday Times 18.4.2004. It-13,000 Malti u Ghawdxi li qeghdin ifittxu x-xoghol serhu rashom b'din l-ahbar? Biex inhaddmu 400 Malti jridu jghaddu 6 snin. B'dan ir-rittmu, kemm iridu jghaddu mijiet ta' snin biex inhaddmu lill-Maltin u Ghawdxin kollha li huma bla xoghol? Tiftakru kemm qalulna li bi shubija fl-Unjoni Ewropea il-Maltin se jkollom opportunitajiet kbar ta xoghol fl-Ewropa? Aqtghu min kisser din il-weghda fierha? Hadd hlief Dr. Simon Busuttil li fartiklu li kiteb fil-magazine tal-Air Malta fJannar 2005 ammetta, For too long European Governments have put off decisions on key reforms. But now we can all see that they did so at a price  stagnant growth and fewer jobs. Dik hi l-Ewropa li dahluna fiha, Ewropa ta stagnant growth and fewer jobs. The Malta Independent on Sunday 18.4.2004. Din hija r-realta ta' Malta wara l-1 ta' Mejju 2004. Din hija l-akbar problema taghna u giet fuqna issa u hasditna. Kif f'daqqa wahda f'dan il-pajjiz Kattoliku, il-Gvern Demo-Kristjan Nazzjonalista jibghat Kummissarju Malti li japprova l-abort? Diga beda jehodna r-rih? Nerga ntenni, din hi l-akbar problema taghna l-Maltin kollha, akbar mill-problemi ekonomici u politici. Din sitwazzjoni li tolqotna fil-laham il-haj ghax tolqot il-fidi taghna. Niftahru li ahna Nsara imma ghall-posizzjoni ta' Kummissarju, l-gvern taghna ghazel politikant prominenti Malti li stqarr li hu favur l-abort. Kollox qieghed jikrolla madwarna! Kemm ser iddum Kattolika Malta? Liema valur Nisrani jmiss li nbaghbsu mieghu? Gazzetti u rivisti zdiedu fil-prezz minhabba taxxa gdida ta' 5 fil-mija fuq il-karta. Din it-taxxa gdida fl-ahhar mill-ahhar jaghmel tajjeb ghaliha l-konsumatur. Min jippublika mhux ser igorr hu z-zieda fil-prezz tal-karta. Biex tevita din it-taxxa trid ma tixtri xejn. Il-ftehim bilaterali dwar viza bejn Malta u l-Libja li kien ilu fis-sehh ghal hafna snin kellu jintemm mas-shubija fl-1 ta' Mejju 2004. Il-Gvern Malti kellu bilfors jibda jitlob viza lill-Libjani li jigu Malta. Il-Gvern Libjan ma kellux ghazla hlief li jitlob lill-Maltin japplikaw ghal-viza qabel imorru l-Libja. Dan holoq problemi kbar ghal kumpaniji li jibghatu l-Maltin il-Libja bil-konsegwenza li whud mill-Maltin ma telghux il-Libja fil-hin u marru minn taht finanzjarjament filwaqt li dawk il-Maltin li kellhom jaslu lura Malta inqabdu l-Libja. Maltese entrepreneurs doing business with Libya are finding that applying for a visa is not a piece of cake they were led to believe it would be. Il-problemi ma ssolvewx tant li f'Lulju The Times habret li, Maltese who work in Libya are still coming up against undue delays in obtaining a visa, informed sources told The Times yesterday. Il-vantagg li bhala pajjiz barra mill-Unjoni Ewropea il-haddiema Maltin setghu jahdmu s-saghra u jaqilghu aktar flus. Imma fMejju 2005 il-Parlament Ewropew iddecieda mod iehor. The vote in the European Parliament in favour of scrapping the opt-out clause in a proposed revision of the EU's working time directive has been criticised by the Malta Business Bureau in Brussels. The bureau represents the Federation of Industries, the Chamber of Commerce and the Malta Hotels and Restaurants Association. It said the removal of the opt-out, which until now allowed Maltese workers and business the flexibility to adapt their working hours according to need, would negatively affect Malta's competitiveness and the targets set out in the National Action Plan for Employment. Bit-tnehhija tal-levies, fabbriki li jiproducu ghas-suq Malti u Ghawdxi kellhom ihabtu wicchom ma' problemi kbar. Veru dan? Din kienet gidba tal-MLP jew twissija fattwali? Qeghdin taraw il-qerq tal-Gvern Nazzjonalista? U min qieghed ibaghti? Martin Degiorgio, managing director of Mondial Ship Agency, Valletta, said that in both 2002 and 2003 the Oceanic was the vessel that brought to Malta the highest number of sea passengers - about 54,000 passengers over 45 calls a year. As a result of Malta joining the EU, which made the island less fiscally attractive as a port, Pullmantur had shifted their vessels from Valletta to Tunis as from the beginning of this season, he said. Many other cruise vessels have in fact left Malta in favour of the North African port and this has resulted in a very sharp fall of cruise passengers for Malta but record figures for Tunis, Mr Degiorgio explained. Spiccatilna s-sovranita taghna li mmexxu l-quddiem dawk il-ftehim ma pajjizi ohra li jidhrilna jkunu tajba ghal Malta. L-Unjoni Ewropea tidhol hi u fejn il-ftehim li Gvern Malti jkun ghamel ma jaqbilx mal-ligijiet tal-unjoni, naqilghu twissija u jittiehdu proceduri kontrina. Dr. Simon Busuttil MEP, Air Malta inflight magazine May 2005. Following the threat of a formal state aid investigation, Malta has notified the European Commission that it is to gradually and unconditionally abolish the fiscal advantages offered to International Trading Companies (ITCs) and Companies with Foreign Income (CFIs) by 2010 at the latest. FATT  Futur incert minhabba s-shubija. Malta will have to pay back 288,000 to the EU budget after the European Commission found that Maltese companies had overstocked cheese products prior to the country's accession to the EU in May 2004. It was disappointing to note the lack of support for Malta from the majority of European Union countries which had been invited by Jacques Barrot, the EU Commissioner for Justice, to share, on a voluntary basis, Malta's illegal immigration problem. Vanessa Frazier, director of defence at the Office of the Prime Minister, said that Malta was so far the only EU country which had sought to evacuate its nationals from Tripoli. She said that when Malta asked other countries and the EU itself to help in further evacuation trips, no funding had been forthcoming. - Prices have soared across Euroland as traders have taken advantage of the changeover to rip off their customers. - In <?xml:namespace prefix = st1 ns = "urn:schemas-microsoft-com:office:smarttags" />Athens bus fares have risen so much that public transport staff are refusing to collect them. - The peoples of Euroland are in revolt over the single currency. - More than half of the Dutch and the French have called for a return to their old currencies. - In Germany, where more than 41,000 businesses collapsed in 2002, over a third of the people want the Mark back and shops have responded by offering to take old Marks. Italian retailers have followed suit by accepting Lira. The EU Commissioner for the Internal Market, Frits Bolkestein yesterday cautioned Malta against a hasty introduction of the Euro. Intant, bl-istess mod immatur u ghami li bih il-PN fil-gvern dahhal lil Malta fl-Unjoni Ewropea, issa l-istess gvern ikkonferma li ser idahhal il-Euro. U x'qal Tonio Fenech? Parliamentary Secretary Tonio Fenech did not mince his words yesterday when he stated that Joining the Eurozone is not an option. The Malta Independent 16 t'Ottubru 2004. Jigifieri dan hu l-istess argument li kien gab Dr. Fenech Adami mill-bidu nett li m'hemmx triq ohra hlief li Malta tkun membru tal-Unjoni Ewropea, issa Tonio Fenech qieghed jghid l-istess li m'hemmx triq ohra hlief li Malta tibdel il-Lira Maltija mall-Euro. X'jigifieri m'hemmx triq ohra? Pajjizi ohra membri zammew il-munita taghhom allura hemm triq ohra. Dawn l-argumenti li qisu d-destin taghna ghamilulna haddiehor huwa wiehed xokkanti u argument anti-patrijottiku li ma jhalli l-ebda dubju dwar il-politika servili, dghajfa u bla hila tal-Partit Nazzjonalista fil-gvern. Tistennewx xi haga ohra minn dan il-partit. Joining the euro was, and still is, not simply a political decision; it has a vast array of economic considerations. One has to keep in mind that there is no turning back after joining the euro. 50% tac-cittadini tal-istati membri jaraw in-nuqqas tax-xoghol bhala l-akbar problema. imma l-ammont lil <?xml:namespace prefix = st1 ns = "urn:schemas-microsoft-com:office:smarttags" />Malta baqa ta 805 miljun. Ghaliex? Skond il-PN, Moviment IVA, MIC ecc, <?xml:namespace prefix = st1 ns = "urn:schemas-microsoft-com:office:smarttags" />Malta bhala membru fl-Unjoni Ewropea taghmel parti integrali mill-Unjoni. Allura suppost dak li taghmel u jsir fl-Unjoni Ewropea daqs li kieku qieghed isir fMalta u minn Malta. Huwa ghalhekk stramb li The Times titfa ahbarijiet mill-Unjoni Ewropea bhala ahbarijiet ta barra!!! Araw dawn l-ahbarijiet thawn fuq, l-ewwel rigward li Malta ma tistax tbiegh hrieqi minghajr VAT jew bVAT imnaqqas imbaghad li l-Kummissjoni Ewropea hadet passi kontra l-Gvern tal-Hamas. Jekk ahna parti mill-Unjoni Ewropea dawn huma affarijiet taghna (ta gewwa) galadarba ahna parti mill-UE. Azzjoni mill-Kummissjoni Ewropea li hu organu ewlieni tal-Unjoni Ewropea, hija azzjoni li Malta involuta fiha wkoll, anzi Malta ghandha l-kummissarju taghha (Joe Borg) fil-Kummissjoni Ewropea. Ahna ma ta gewwa jew le? Jew fejn ikun hemm ahbarijiet negattivi, l-Unjoni Ewropea hija xi haga barranija? Ahna gewwa jew barra? Parti mill-Unjoni Ewropea jew le? <?xml:namespace prefix = st1 ns = "urn:schemas-microsoft-com:office:smarttags" />Malta faces legal action by the EU executive for allowing shops to sell children's nappies at reduced tax rates. The European Commission is also expected to start legal action against Poland, the Czech Republic, Hungary, Portugal and Malta for allowing nappies to be sold at lowered VAT levels, a European Commission official said yesterday. "These countries are in violation of EU rules, which do not allow reduced VAT on nappies," the official told Reuters. was taken a few days ago after a number of articles appeared in the Maltese press criticising the Commission for giving the contract to a PN-owned company. The criticism mainly addressed the issues of conflict of interest and indirect party funding. The decision was confirmed to The Times yesterday by Mikolaj Dowgielewicz, spokesman for Margot Wallstrom, European Commissioner for Institutional Relations and Communications. Il-Mexxej Laburista Alfred Sant iddefenda l-aġir ta' l-Ewro-Parlamentari Laburista Joseph Muscat, li wara pressjoni li għamel fuq il-Kummissjoni Ewropea tellef kuntratt ta' xogħol lill-kumpanija Maltija Informa. Sant esprima ruħu sodisfatt ħafna u kuntent li rnexxielu jtellef dan il-kuntratt lil Informa. Tessa Baluci, Informa Library, Pietà. L-Agenzija Informa hija parti mill-operat tal-Partit Nazzjonalista minkejja l-attentat tas-Sinjorina Baluci biex juri li l-Partit Nazzjonalista ma kienx involut fdan il-kaz. L-Agenzija Informa u l-Partit Nazzjonalista huma haga wahda u jitkelmu ghal xulxin. Dr. Sant ma tellef l-ebda kuntratt ta xoghol lill-Agenzija Informa tant li Baluci stess ammettiet li l-kuntratt xorta se jibqa fis-sehh sat-terminu tieghu. L-ghazla tal-Agenzija Informa ghat-tigdid tal-kuntratt qatt ma kienet garantita. Jekk il-PN irrabjat u ghandu xi oggezzjoni ghad-decizjoni tal-Kummissjoni, ghandu jindirizza l-oggezzjoni tieghu lill-Kummissjoni u mhux johloq stejjer biex jattakka l-mexxej Laburista. First it comes up with the slogan So that <?xml:namespace prefix = st1 ns = "urn:schemas-microsoft-com:office:smarttags" />Malta grows in the EU and uses it in the MEP election (which it lost), then it promptly forgot all about it and discarded it just as one would get rid of a pastizzi paperbag. It then proceeded to go directly and diametrically opposite to what it had claimed to be doing. Instead of helping Malta to grow bigger in the EU, it is cutting off Malta ever more from the EU, thus reinforcing the natural isolationism of the Maltese nation. the Maltese have not only cut down on their travels abroad (a mark of Europeanness if they were to travel to Europe and also a signal of an improved standard of living), but are actually travelling less. Which accounts for the queues of cars that clog the roads leading to Golden Bay and Mellieha Bay and Cirkewwa, to queue for the Gozo ferry, every weekend. They have nowhere else to go. By choosing the taxation route in its bid to solve the financial problems of the country, it completely disregarded the well-being of the people and forgot that one way of feeling we are European is to feel affluent and at home in Europe. The Maltese have ended working much harder for lesser returns. The Maltese government's frustration, faced as it is with a serious illegal immigration problem, has led Deputy Prime Minister Tonio Borg to openly criticise the European Union of being slow to respond to the island's needs. Simon Busuttil, Air Malta inflight magazine, Novembru 2005. BUDAPEST/ Malta (di-ve news) June 30, 2006 -- 1750CEST -- During bilateral talks with the new Hungarian foreign Minister on Friday in Budapest, Michael Frendo said that Malta is adamant on EU assistance for illegal immigration. The European Union is dealing with Malta with the mentality of small countries, small problems and this is unacceptable, Minister Frendo told his Hungarian counterpart. According to the Minister, too much importance is being given to Spain while Malta is being left in the lurch. Foreign Minister Frendo said that Malta, as part of the central Mediterranean route for illegal immigration, is being affected very badly as a result of action being carried out only on the Western Mediterranean route. The value added tax charged by the Maltese government on the registration fee of cars bought since May 2004 has to be refunded, European Taxation Commissioner Laxzlo Kovacs said in reply to a parliamentary question by Labour MEP Louis Grech. Mr Kovacs said that people who paid VAT on registration tax could seek repayment of the tax paid in breach of European law. He said that it was the duty of the national courts to apply domestic rules, and these should ensure that taxes imposed in breach of community legislation were reimbursed. Mr Grech has been working on the issue since 2007 when together with former MEP Joseph <?xml:namespace prefix = st1 ns = "urn:schemas-microsoft-com:office:smarttags" />Muscat, now leader of the Opposition, they had informed the Commission that this tax was not in conformity with a decision taking by the European Court of Justice and so it was illegal. The Commission said it would be launching a procedure against Malta on the matter. It was also examining the newly amended legislation.